Caters to all audiences, including brand executives. Speaks at the level of a historic brand. 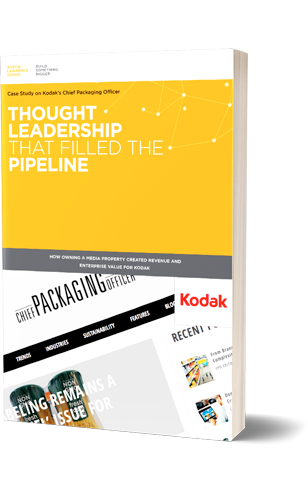 Learn how to marry brand publishing with thought leadership and ROI. The real key to success — and the factor that sets this content strategy apart from others — is a solid BUSINESS CASE that enables management to sell the idea in the first place. Identifying personas that would attract an audience interested in Kodak's automation software. Employing a lead pipeline model that demonstrated ROI. Publishing content that spoke at the level of an iconic American brand. Creating a name and image that the new CMO could get behind. Copyright © 2016 Austin Lawrence Group. All Right Reserved 2019.